Paxton is a UK-based company that designs and manufactures a range of cutting-edge access control technology. They've been among the industry's leading lights for three decades, and according to the company website, roughly 25 thousand buildings worldwide are secured by Paxton each year. Here at IDS Security Systems Ltd, we frequently install and maintain Paxton access control systems for clients across Wales and England. Our engineers can personally vouch for the quality and user-friendliness of Paxton's technology, although if we believe that a different system would be better-suited to your requirements then we will be only too happy to advise. 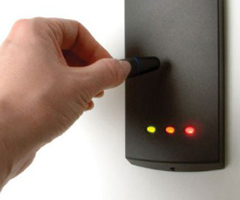 No matter what kind of access control solution you're seeking, IDS Security can help. Click here to request a quote, or give us a call on 029 20 753 251 to learn more about the access control services we can provide.